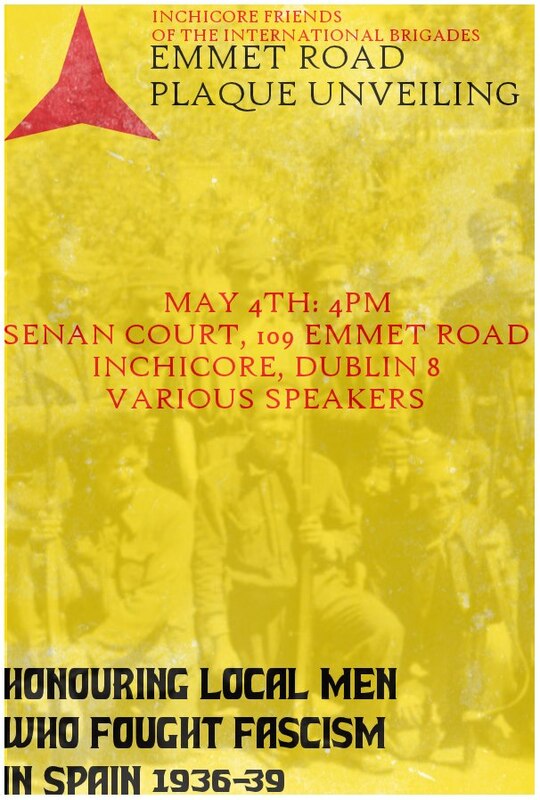 Inchicore and the Spanish Civil War (Plaque unveiling, May 4th) | Come Here To Me! On 4 May, the Inchicore Friends of the International Brigades are erecting a plaque to the memory of six local men who went to Spain to defend the Spanish Republic against the military coup of July 1936. A Facebook event page is here. Seen by many as the first act of the Second World War, the Spanish conflict pitted the majority of Spaniards and their democratically-elected government against their own military, backed by troops, aviation and materiel from Hitler’s Germany and Mussolini’s Italy. A non-intervention pact arranged between the European democracies forced the Spanish government to rely on the assistance of the Soviet Union, however tensions between the disparate elements supporting the government and increasing military assistance from international fascism and global capital ensured the victory of Franco’s armies and the subjection of the Spanish people. The repression continued until the dictator’s death in 1975. Inchicore is unusual because of its development around the railway works and for the multiplicity of religious faiths (and none) represented in its workforce. Perhaps as a result of this mixture of socialism and non-conformity, Inchicore had a unique concentration of volunteers in the ranks of the International Brigades. Of the six men commemorated, two came from a protestant background and all had republican or communist connections. Three died in Spain and one survivor was to write perhaps the most significant first-hand account of the early fighting (Joe Monks, With the Reds in Andulusia, London, 1985). Tony Fox (1914-28.12.1936). From Goldenbridge Avenue, Fox was a member of A. Coy., 4th Batt., Dublin Brigade, IRA and was with the first organised detachment of Irish volunteers to join the International Brigades. He crossed the Pyrenees with Frank Ryan and his school friend and neighbour Mick May on 15 December 1936 and was killed in action at Lopera on the Córdoba front less than two weeks later. Fox had just finished dressing the wounds of two friends, John Gough and Seamus Cummings, when he himself was fatally wounded. His body was never recovered. Mick May (1916-28.12.1936). Michael May from Connolly Avenue was also a member of Fox’s IRA unit. He was additionally a member of the Communist Party of Ireland. He died close to Tony Fox at Lopera on 28 December 1936 and was last seen alive, single-handedly covering the retreat of comrades, armed with a rifle. Liam ‘Bill’ McGregor (d. 22.09.1938). McGregor was the Dublin secretary of the Communist Party of Ireland and the son of Esther McGregor, president of the Municipal Tenants’ Association. He attended the Lenin International School in Moscow and on his return volunteered to fight in Spain. He was killed on the very last day the XV Brigade saw action on the Ebro front, alongside fellow Dubliner Jack Nalty. Joe Monks (1915-1988). Joe Monks came from Park Street and went to school in James’s Street with Tony Fox and Mick May. A member of the Communist Party he was one of the initial volunteers along with his two school friends. He was one of the defenders of Connolly House, headquarters of the Revolutionary Workers’ Group (forerunner of the Communist Party of Ireland) when it was attacked in March 1933 by a hymn-singing mob. Author of With the Reds in Andulusia, Monks was wounded in the chest at Lopera but was to see further action in March 1937 at the little known battle of Almadén. He was repatriated later in 1937 and was active with the Republican Congress before immigrating to the UK where he remained involved in radical politics until his death in 1988. Paddy McElroy (b.1911). Paddy McElroy came from 20 Nash Street. His brother Christopher had taken part in the 1916 Rising. A mechanic with the TE&FU, he joined the XV International Brigade on 7 January 1937 and was seriously wounded at the battle of Jarama outside Madrid in February. He was repatriated on account of his wounds and after a brief stay in Dublin he appeared again in Cairo in 1939. Returning to Liverpool via Durban, he was curiously listed as a government official with an address in Southampton. He was subsequently involved in a wages hold-up at Amiens Street in March 1943 and was defended by Sean MacBride. From this point onwards McElroy disappears from the historical record. Bill Scott (1908-1980). Bill Scott came from Ring Street and was a member of the Communist Party of Ireland. One of the Irish Citizen Army’s earliest recruits was his father, William Scott, a member of the Church of Ireland and an activist in the Bricklayers’ Trade Union. During the 1916 Rising, Scott fought alongside William Partridge in the College of Surgeons garrison, under the command of Michael Mallin and his deputy Constance Markievicz. His son was possibly the very first Irish International Brigade volunteer to fight in defence of the Spanish Republic, finding himself in Barcelona at the Workers’ Olympics when the coup broke out. He was elected political commissar for the English Tom Mann Centuria in September 1936, before joining with the German Thaelmann Battalion in the defence of Madrid. Bill went back to Ireland where he was withdrawn as a CPI candidate in a Dublin by election in favour of Frank Ryan. He returned to Spain with Ryan and received a serious leg wound and was sent back to England. Disillusioned with the Molotov-Ribbentrop pact, he left the CP for a period before re-joining in 1941. He then became a member of the Essential Construction Corps, building infrastructure throughout the UK. After the war he continued his trades union activities until his death in 1980. Anyone know if Tony Fox was in any way related to Laurence Fox who had a dairy at 6 James’s St.? on September 30, 2013 at 5:09 pm | Reply A look at the “St. Mary’s Anti-Communist Pipe Band.” | Come here to me!